Recordings of these Bushcraft Show main stage presentations are below. 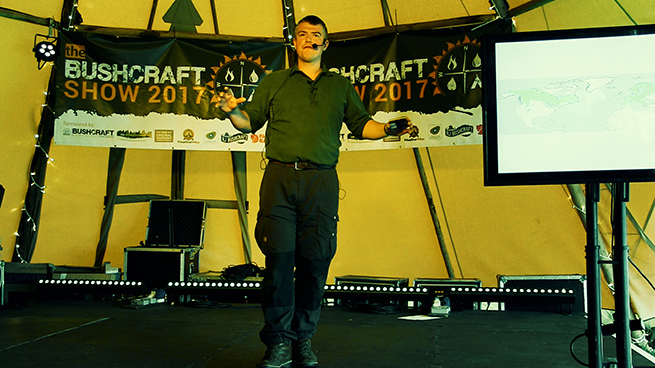 I made a number of presentations and demonstrations at the 2017 Bushcraft Show. Below are videos of the full recordings of both of my main stage events. The first is my keynote, titled "Accelerating Your Bushcraft Learning". This is a brand-new presentation which I had not given before. The video below contains all the slides I showed on the screen too. The second video is a recording of the live #AskPaulKirtley I hosted at the show. This formed number 53 in my series of question-and-answer shows, all of which are available as videos and audio podcasts. ...And if you like it, please subscribe so you don't miss out on any of my videos, which I add on a regular basis. Ok, I’ll bite. I’ve seen this one before, but you’re saying we can become conversational bushcrafters by taking it a few steps at a time. Like learning English ( as I did coming from a French Canadian background), it was learning the common words that were used mutually within my interest groups. With that, we got on well, and the conversations expanded from then on as we maintained communication. The points of interest here are a good simple knife (the Mora for example) and practicing important techniques, especially safety, with the knife. Learn to make a fire and get good at it; but especially, learn to enjoy the woods, nature, the weather, the elements, the seasons. Ultimately, bushcraft skills are only a means to enjoy nature without being encumbered with modern amenities. Mors Kochanski coined it well saying, “the more you know, the less you’ll carry.” But for now, carry what you need to be comfortable, and eliminate as you get better and more self-reliant. It’s a journey of a thousand miles, so just get going. It starts with one step.